This is a new feature for The Source in which I express actual opinions while working for government. Members of the media: please take any of these ideas and run with them — we could use the coverage! Nevada Falls with Liberty Cap and Half Dome in the background at Yosemite National Park. Photo by Steve Hymon. 2. I’ve seen little discussion of a topic I find interesting: how high-speed rail could positively impact national parks in California. If the bullet train gets built as planned, there would be stations in Visalia and Fresno – gateways, respectively, for Sequoia/Kings Canyon and Yosemite national parks. At present, the only way to reach the parks is to drive there or take a charter bus or to drive to one of the mountain towns outside the park and take a shuttle (which are few and far between). The bullet train, on the other hand, could allow people to reach Hanford (which is near Visalia) or Fresno in speedy fashion and then – if someone puts this in place – catch a shuttle to the parks. 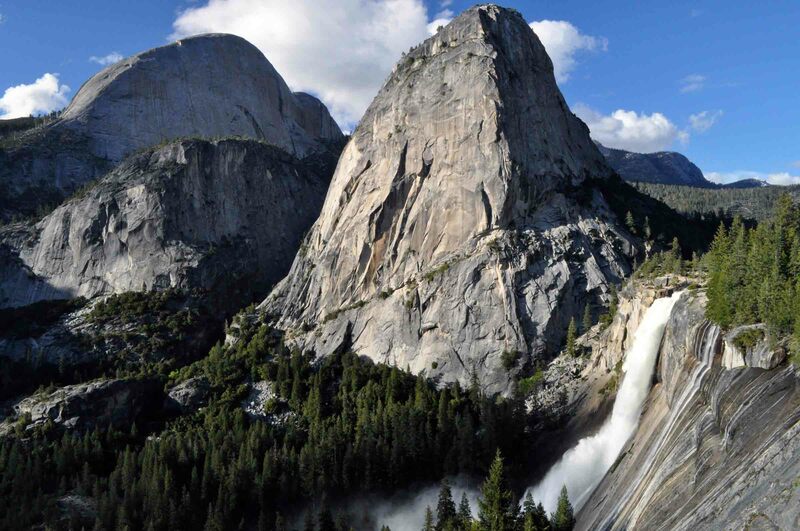 Both Sequoia/Kings Canyon and Yosemite have had problems grappling with the volume of private cars driving through the parks and good shuttles from the bullet train – it seems to me – could reduce the need for everyone to drive to the parks. 3. I’m getting a Clipper Card before my next visit to the Bay Area – one card can be used to pay fares on the Muni, BART, Caltrain and ferries. No more fumbling with fareboxes and ticket vending machines. 4. I know there’s been a lot of talk in some neighborhoods about at-grade light rail crossings impacting traffic. And it’s hard to deny that when the gates are down, traffic doesn’t move as well as it when the gates are up. That said, can someone show me a light rail crossing in the L.A. area or anywhere else that has impacted traffic beyond repair? If such a crossing exists, I’m not aware of it. 5. A century ago, California had 2,377,549 residents. Today it has 37,253,956. That’s one of the many fascinating facts courtesy of the Census Bureau’s release of state population numbers from the 2010 count. Here’s another one: the five most populous states (California, Texas, New York, Florida and Illinois) have a combined population of 113,409,561 – which is 36.7 percent of the nation’s total population. All five of those states boast some of the United States’ largest urban areas and this suggests to me that’s where the nation should be investing a lot of its infrastructure dollars. Arguments anyone? With respect to travelling to national parks on rail… There is, in fact, an actual rail station (Kelso Station) in the middle of the the Mojave National Preserve, near Baker. There was even a one-time-only special train from LA to Kelso this year. If we could make that a regular service, and then rent bikes at Kelso Depot, it could make for a nice tourist destination. You can take rail from LA to the Grand Canyon. 1. I say take a step further and get rid of lanes on each side of the 405 and the 710 and build a heavy rail through it. 3. Yes, and they also had the value-added function before the Clipper (Translink) too. 5. Sure, I’m all for it, but please try to reduce your dependency on taxpayer dollars and go to a more profit oriented model. If you can reduce subsidization of public transportation by taxpayer funds by even 10% that’ll help a lot on our burden as taxpayers. As I said before, try looking at a distanced based model for not just rail, but for buses as well. Japan is able to manage it with a distance based model and they have 33 million people on the move everyday just in the Greater Tokyo area alone. Why can’t we? Regarding delays at light-rail crossings, we have to remember that while crossing while add some delay to motorists, the delay will be a fraction of the delay imposed by a standard intersection going through a signal cycle. Motorists won’t even notice the Expo Line crossing compared to the many red lights they will encounter during their commute. If you look at the long term when the need for more frequencies of trains are needed, then you’re gonna see problems with at grade crossings. Fortunately (or unfortunately) we only have trains coming in at 20 min intervals here in LA. But down the road when we begin to need more train frequencies like one train every three minutes during heavy commuting periods, then you have a problem of never ending train signals going up only to come down just a few moments later. Good point about at-grade crossings. This has been my main issue with metro for a while. In a city this large, no matter what we are going to see issues down the line with the at-grade crossings, it simply does not account for future growth the way it should. People will say it costs a lot now, but its eventually going to be an expense that is necessary anyway in the future not far from now. If we wait then then for the inevitable, its going to cost even more and be more inconvenient to restructure our lines when service is already running. We need foresight now so we can be prepared for it. Other developed cities have done this and have avoided many of the expenses that come with adding later to compensate. The ridership is not going to stay where it is forever. It just does not make much sense to say, oh we can add it later, with the population and traffic growth as fast as it is. A couple months ago I ended up at one off the Blue Line crossings in Vernon along Long Beach Blvd. After the northbound train cleared the intersection, the gate stayed down for way longer than anything I’ve seen along the Gold Line. I know in Pasadena it takes about 5 seconds after clearance to begin ticking upward. Metro PR said the timings for the Blue Line crossings are the same as the Gold Line. But I definitely witnessed otherwise. I won’t be able to head out along the Blue Line again until next month, but perhaps you could chime in. Maybe this was just one-time fluke? Metro can’t mess this up along Expo or else it will be a huge PR mess. Hey Steve, In response to #4… A couple months ago I ended up at one off the Blue Line crossings in Vernon along Long Beach Blvd. After the northbound train cleared the intersection, the gate stayed down for way longer than anything I’ve seen along the Gold Line. I know in Pasadena it takes about 5 seconds after clearance to begin ticking upward. Metro PR said the timings for the Blue Line crossings are the same as the Gold Line. But I definitely witnessed otherwise. I won’t be able to head out along the Blue Line again until next month, but perhaps you could chime in. Maybe this was just one-time fluke? Metro can’t mess this up along Expo or else it will be a huge PR mess. Re: #2, Amtrak California currently offers train service from Bakersfield, Oakland and Sacramento to Merced or Hanford. (There are Amtrak buses from Southern California to the terminus in Bakersfield). From Hanford you can get to Visalia on an Amtrak Bus, and from Merced there is a direct Amtrak bus to Yosemite park.